Note: I only write about social and political issues at my personal blog, if I think that I must. This article qualifies as such. It also seems to be an issue that only applies to Americans and not other western or developed countries as far as I know. Correct me on that one, if I should be wrong about this assumption. I recently watched the 56 minutes long episode ?? ?The Card Game??? of the PBS documentary series ???FRONTLINE?? ?, which premiered on American television on 11/24/2009, investigates the massive US consumer loan and credit card industry and its abusive behaviors in the past and present in an unregulated marketplace where anything goes. The video recording of this documentary can be watched online at the PBS.ORG web site. I was aware of many of the aspects of the American loan industry and surprised that such predatorily behavior that was demonstrated by all US Banks and other private enterprises was perfectly legal in this country. I was initially shocked when I learned about those realities and still disgusted by it and by anybody who argues that this is okay and perfectly normal in a free and market driven economy, especially if those individuals claim that the those cases which might be considered excessive are only exceptions and not created intentionally for profiteering by those companies and banks that cause them. Some of the facts from the documentary were even new to me and disgusted me only more and at the same time aware of the fact that there is a pressing need for change, especially in times like these. I highly recommend watching this video. I decided to write this post to extend on that and also raise the awareness that most other free countries in the world already did something about the problem hundreds of years ago. Some people describe the industry as the ?? ?Wild West?? ?, but the Wild West was never that wild in comparison. The only thing I can think of to compare it to is defined as ?? ?organized crime??? and generally known as criminal acts committed by a ???Mafia???. Many members of the Mafia served and serve prison sentences for crimes that dwarf the, for the average JOE indistinguishable from each other, but perfectly legal practices (under U.S. laws) committed by the banks. There is no doubt that those practices are considered ???immoral??? and worse by the vast majority of people in the United States and are outright illegal in most other western countries, including Great Britain and my own native country of Germany. In law, the crime of charging an unlawfully high rate of interest. In Old English law, the taking of any compensation whatsoever was termed usury. With the expansion of trade in the 13th century, the demand for credit increased, necessitating a modification in the definition of the term. In 1545 England fixed a legal maximum interest, a practice later followed by other Western nations (with the exception of the United States*). English: usury = lending money at exorbitant interest rates. archaic interest at such rates. Those definitions are in my opinion too short and also too narrow to capture the full meaning of the German word ???Wucher???. So I will try my best for my own definition to describe it to you. Usury describes the offering of a service and demanding in return for a clearly excessive compensation, exploiting a situation when the party this service is being offered to is the most vulnerable and typically left without another choice with the exception of extreme and typically immediate destructive ones. It could also be an offer where the actual compensation the party that became victim of usury agreed to was well hidden in the agreement itself. The victim would have been unaware of it during the time when the agreement was made, not consent with the fulfillment of its obligation when it becomes apparent, and never had knowingly agreed to those terms when the contact was sealed. Usury is a legal exception to a free economy that is in general market driven without government interference for an exceptional situation that is clearly located outside of the typical free market environment. Usury could be described as the financial world equivalent of extortion, fraudulent deception or trickery committed in the real world. Contractual agreements imposed by one party on another that could be described as Usury are also often the attempt by one party to ?? ?lock in??? the other one in a vicious and destructive cycle to extort the maximum amount of profit from the party that fell victim of a usury (typically exceeding the value of the original services that was provided by the first party many times over) and in many cases leading to a point where the victim becomes unable to fulfill the obligations demanded by the agreement. The setting of a maximum interest rate for a loan transaction is one method to prevent usury, but not the only or even best option, because it would not protect against usury committed outside of loan transactions, but the same premise and outcome. durch das jemand unter Ausbeutung der Zwangslage, der Unerfahrenheit, des Mangels an Urteilsverm? ?gen oder der erheblichen Willensschw? ?che eines anderen sich oder einem Dritten f? ?r eine Leistung Verm? ?gensvorteile versprechen oder gew? ?hren l? ?sst, die in einem auff? ?lligen Missverh? ?ltnis zu der Leistung stehen. Quote taken from the German Language Wikipedia entry for ???Wucher??? ?? ?that someone through the exploitation of the position of constraint, the inexperience, the lack of judgment or the considerable lack of will-power of somebody, takes advantage for one selves?? or a third?? party?? intending or not preventing to gain material advantages for a?? reward or?? financial promises that are strikingly disproportionate to the value of the provided service .??? Mutual agreements or contracts that qualify as usury are automatically void and never considered valid or binding from the start, even if they were signed by both parties. Since the definition does not include any specific figure or exact definition of what is ???disproportionate??? in return for any given service, courts normally have to decide that on a case by case basis, evaluating all objective and subjective arguments from both sides, but the general ?? ?rule of thumb??? is that in virtually any case a usury is committed, if the required compensation for a service is in excess of twice the value of the original service provided by the usurer. A $30 ?? ?overdraft fee??? that is charged for a transaction that exceeds a person?? ?s account balance by $15 or less and covered by the ?? ?overdraft protection service??? 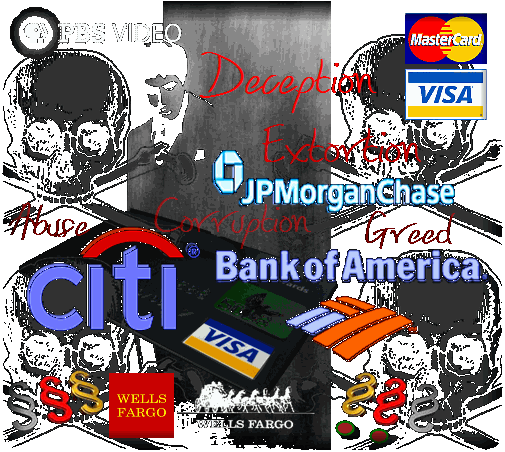 provided by the bank is a clear case of usury. As stated already, it is irrelevant if the person agreed to the terms of this service or not. Making the customer aware of the fee alone is not enough, because the customer is typically unaware of all the facts required to be able to predict the invocation of the service due to the lack of transparency of the underlying transactions that trigger it. Unexpected freezing of funds for some reason, delayed processing of transactions unfavorable to the customer or expedited processing of transactions favorable to the bank, non-chronological booking order are often the cause for the unintended activation of service by the customer thus preventing the customer from avoiding it in the first place. Usurers could even face civil and criminal charges in Germany, risking imprisonment, depending on the amount of damage that was caused to the other party as a direct or indirect consequence from the usury. By German law, ALL CEO?? ?s of US Banks would most likely have to spend long prison terms for all the damage caused to people as a direct consequence of the usuries committed by their banks. The practice of so called ?? ?payday loans??? (short term cash advances offered for a high fee) is beyond doubt usury and thus illegal in Germany by definition already, even though the fees are much lower than twice the amount loaned when only looked at the nominal values of those transactions. However, the transaction is for the average person indistinguishable from a ?? ?loan transaction??? as defined by US laws, even though it does not qualify as such in the US legal system. The standard terms for the calculation of due return payments of loans are defined by the annual interest rate applied to the loaned amount. In the case of payday loans, this annual interest rate is typically over 400%, which is far beyond 200% of the ?? ?thumb rule???. The PBS documentary shows that recent legislation made by the Obama administration was incapable to really address the issue, changing virtually nothing and certainly not the behavior, not to mention the attitude, of the American banks to protect the free economy from such predatory behavior. If you ask a criminal who was sent to jail for committing crimes like extortion or trickery, they will most certainly claim their innocence, trying to convince you that their victim had either a choice (in the case of extortion) or they should not have been blamed for the lack of comprehension, knowledge or intelligence in the case of the victims of their trickery and deceptions. Compare this to arguments made by PR (Public Relations) agents and lobbyists for the banking industry and you might find them to be striking similar to each other with only one major difference. In the first case they come out of the mouth of a convicted criminal wearing a ???striped??? prison uniform and in the other out of the mouth of a well groomed person wearing business attire. A law that protects honest people and businesses from usury is just as bad in a free market economy (or necessary) as criminal laws that protect the same honest people and businesses against extortion and trickery, and what is wrong about those? Are they limiting your personal liberties and freedom? The criminal who was sent to prison because of them probably would agree, but do you? Feel free to comment or express your own opinion about this subject via the comments section below. You can do this anonymously, if you don?? ?t want to state your name. I will publish any comment unless it is nothing more than a personal attack of any other person (including myself)?? without any factual proof to backup any defamation attempts, off topic spam or stuff that is illegal and could create any legal issues. Next Post: Malware Threat Warning! Scam via Online Video!